Ben Meyer’s review of British artist Jeremy Deller’s mid-carrer show at the University of Pennsylvania Institute of Contemporary Art emphasizes that the cross-cultural experience needs to be absorbed and enjoyed slowly. We agree. It takes time to step into other times and places. 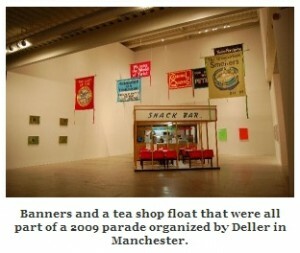 Many of Deller’s pieces are about his native Manchester and the 1984-5 miner’s strike that occurred there. No doubt he had to take multiple slow looks at his culture to engage with it in a unique way and make creative connections. For example, in one project he joins a brass band to acid house music, linking the two conceptually through the unrest of the 1980s. Whether you are British, American, or of another nationality, taking time to really see and understand works like Deller’s can help you to make your own meaningful connections to other cultures. Thanks to Ben Meyer and theartblog.org for pointing us to this show. Be sure to visit and take a nice slow look if you are in the Philadelphia area. This exhibit reminds me of the similarities between critical thinking (such as a research paper) and visually engaging with art. It seems like Deller’s work combines both careful observance and artistic exploration together in this show. 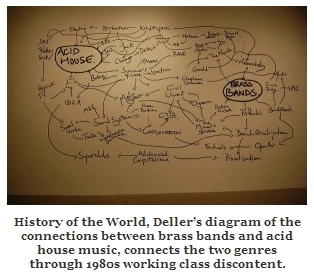 I love that diagram connecting Acid House and Brass Bands, ethnomusicology is something quite interesting to explore.